A third-person action-RPG with XP loss on death, bonfire mechanics and a taste for the grotesque, Code Vein has been billed as Bandai Namco’s in-house alternative to the Souls series, trading Bloodborne’s fetid strain of European Gothic for a world of anime vampires. Witness the marketing tagline, “prepare to dine”. So it’s a slight shock to find that the new game breaks from one of From Software’s unwritten core principles straight out the gate. Integral to every Souls game is the experience of loneliness, that sense that you are the only moving object in a cyclopean expanse of dead architecture and stagnant myths. True, you can summon allies to aid you, but these are presented as fleeting, ethereal interactions, and you never feel like you have “companions”, exactly. It’s more a question of being haunted by kindred spirits as you set out through the wasteland alone. 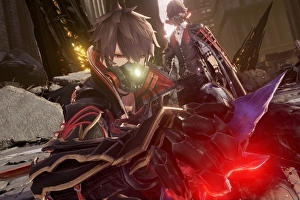 Code Vein also deals in wastelands, but you’ll have plenty of more persistent and straightforward company throughout, for better and possibly worse. The game is set in a shattered semi-urban environment where amnesiac Revenants search for the Blood Tear fruits they need to subsist without feeding on humans, battling hordes of misshapen Lost vampires who have been consumed by their own bloodlust. Each Revenant you meet in the eponymous Vein has different capabilities and is on a quest of their own, often involving their missing memories. You’ll be able to recruit some of them as co-op buddies, and as I discovered, these buddies are a little on the chatty side. During my demo I was paired with Mia, a baby-faced predator with a powerful rifle. She kept up a running commentary as we explored, responding to everything from lower player health through collecting items to opening the inventory screen. Her remarks were always brief and to the point, in fairness, and the script has a certain, pleasing self-awareness to it: at one stage, the character praised me for swinging at a corpse to ensure that it was genuinely dead, one of the more time-honoured Souls player traditions. Still, it’s easy to imagine that trickle of small-talk becoming an annoyance as you push deeper into each dungeon. This kind of thing makes sense in an Uncharted game, but when I’m probing the ghastly secrets of post-apocalyptic catacombs, the last thing I need is background patter.